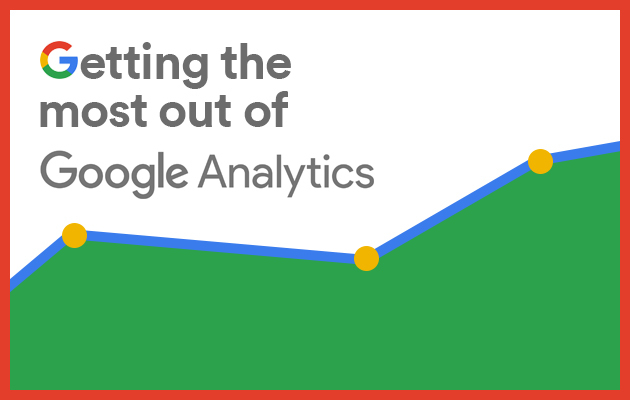 Google Analytics is an essential tool if you want to know who’s using your site and what they’re doing while they’re there. The insights it can provide into the behaviours of your users will help you improve your site based on actual stats, as opposed to merely guessing who you think your audience are and what you think they want. It can however be a bit complex to figure out Google Analytics and, knowing that many people fall into the same traps, we’ve put together a handful of 6 friendly tips for anyone starting to use it. You’re welcome. While we’ve just waxed lyrical about the fact that GA is a useful way of discerning what your users want, it’s important to remember that there are other ways of getting to know your audience and finding out how your company’s doing on line, particularly if you’re active on social media. The various social media platforms will have their own ways of analysing your online viability. Both Facebook Insights and Twitter Analytics are invaluable in for monitoring engagement, finding out which posts performed best and how many people were reached. The more you use these tools the more you will learn from them. If you send out email marketing campaigns then the tools you likely use for this, such as MailChimp or Campaign Monitor, will provide you with an overview of how well each email performed; which links attracted the most clicks, who opened the emails, who marked it as spam and so on. You can even see a real-time map of people opening your email across the world (if your recipents stretch that far). It’s important to factor these successes and failings into an overview of your company’s online performance too. It’s easy to think that when people talk about conversions they only mean sales. This isn’t true. It might be easier to think of them as ‘successful interactions’. So what might be a conversion for you might be as simple as someone opening a certain page, downloading a file, joining your mailing list, watching a video or getting in touch with you. It doesn’t have to involve them buying something directly from your site. If a user converts from being a mere visitor to doing the thing you wanted them to do while they were browsing then hey, Mission Accomplished right? This certainly isn’t restricted to e-commerce sites and Google Analytics can help you see the circumstances surrounding this conversion so you can see what you’re doing right and improve upon where you may be going wrong. It’s easy to obsess over one report on GA and forget about the others but they all tell you something different and worthwhile. Keep an eye on reports across the board. The Audience Overview report will the first one you’re presented with when you log in, which is far better than nothing, but the further reports in the sidebar will be able to offer you far more indepth insight. You can also check back on previous months, comparing March 2016 to March 2015 for example, as long as you had your Analytics code embedded that far back, which is worth checking. You want to learn as much as possible. If you obsess over something like your bounce rate, for example, you may miss the equally important data on what the people who do stay on your site are doing. Make sure you keep your eyes open by checking out all aspects of the reports on how your site’s performing. Speaking of the code, it’s important to remember that Google can only track visitors for pages where the right code has been embedded into the site. Don’t make the mistake of thinking that you don’t need to track a few of the pages on your site. You might be missing something important. That also goes for any new pages as you create them too. You don’t want to knowingly leave gaps in your data. As we said before, comparing March 2016 to March 2015 can be useful to see your online growth or map out trends. But making comparisons between stats that have no correlation won’t tell you anything. So, for example, avoid comparing any month to the Christmas period as this isn’t going to give you a true idea of user growth, particularly if you’re a retailer. It sounds obvious but you’d be amazed how often people pull stats out to examine and compare without really thinking about the selection of data they’re looking at. 6. If you’ve installed it then use it! People set up Google Analytics when launching a site because they know they should, but then forget to actually log in and check out what’s going on. Rookie mistake. It’s a great tool and if you’ve put the effort in you want to know how your site and it’s content are being recieved. If you’re not used to it Analytics can seem fairly complicated but there’s only one way to figure it out and that’s by playing around with it. Only by doing this will you figure out how it can best serve you and your business. If, now you know how to use it, the data on Google Analytics for your site suggests you need to make changes, or you’d simply like to have us build you a whole new website that you can monitor on Google Analytics, then drop us a line. We really love talking about this kind of thing.